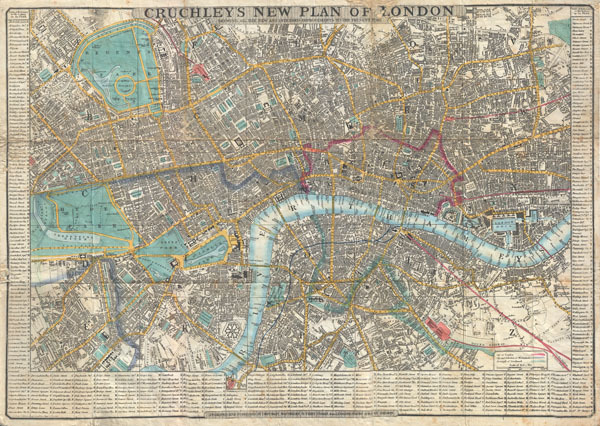 Cruchley's New Plan of London Shewing all the new and intended improvements to the Present Time. / Cruchley's Superior Map of London, with references to upwards of 500 Streets, Squares, Public Places & C. improved to 1848: with a compendium of all Place of Public Amusements also shewing the Railways & Stations. This is a very attractive example of G. F. Cruchley's highly desirable 1848 Map of London, England. Covers London from Hyde Park in the west to the London Docks in the east. Extends north to include all of Regents Park and south as far as the South Western Terimini and Vauxhill Gardens. Offers full and color and detail to the street level with individual buildings noted. Map surrounded on left, right and bottom by a street by street index of the city. Title area to center. Backed on linen and bounded into its original linen folder. Cruchley issued various editions of this map from 1827. This issue, 1848, is not in the Hogwego catalogue and is one of the rarest. Very good condition. Original fold lines exhibit some wear. Very minor loss in section G and over the 'L' in London in title. Uneven lower border is a scan error and not evident in actual map. Folds into original linen binder.